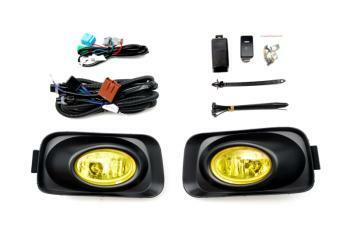 Password JDM Fog Lights - Dezod Motorsports Inc - Home of the automotive performance enthusiast since 2002. Password JDM spec yellow fog light kits will not only add a unique look to your project car, but also will also greatly improve your visibility during harsh weather conditions. All of our kits come complete with everything you need to complete a clean installation. Rest assured when you purchase a Password:JDM branded product, you are receiving quality second to none! Complete kits include both driver & passenger side yellow fog lights, mounting brackets, wiring harnesses, relay, and fog light switch. OEM fit and quality!